Kathy studied popular culture in college, which has fueled her love of playing video games, watching cartoons, reading comic books and otherwise avoiding reality. She's basically a twelve year old with a much more... robustly expressive... vocabulary. She also likes reading about the history of packaging, and salt. She thinks a book about the history of soup would be fascinating. All of this has made her a valued District Trivia player, helping each of her teams make it to the finals and ending up in the top five every time. Which is why she really wanted to become a host, because who needs that stress, y'know? She's a fan of trying to craft fun music rounds for the games she hosts, even though she usually is horrible at them as a player. And hey...she'll also probably mispronounce one or two words every week, just for you! That's the Kathy hosting guarantee! 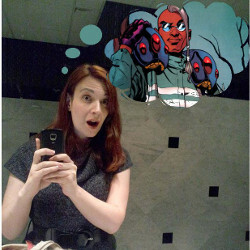 Oh... yeah... she also thinks the mutant Maggott is absolutely the stupidest X-Man ever created. Seriously, the guy's power was that instead of a digestive system, he had two slugs that lived in his tummy that he could push out to eat anything. The slugs' names were Eany and Meany. This really happened. He was the worst. She will FIGHT YOU over it.